“Realizing the hopelessness of the case, members of the crew have rigged up a cable from a high bluff near the wreck to the De Long and the work of salvaging guns, munitions and valuables has started. “A.T. Gilcrest of Half Moon Bay returning from the scene of the wreck declares that there was no chance of saving the vessel. “Pumps are keeping the water from advancing as the crew rushed the salvage work. “Despite the fact that the engine room is flooded and that there is more than six feet of water in the stern much valuable property is being saved. “The United States destroyer, DeLong probably has found its final resting place on the beach a mile south of Halfmoon Bay. “Hopelessly grounded in shallow water, with two rocky reefs behind her and hindering her chances of eer being dragged into deep water, Destroyer ‘129’ probably willl remain on the beach to distinegration. Pigeon Point lighthouse was the private domain of Capt. Marner–a crusty white-haired sea captain who deeply loved ships. From his “white pinnacle” at Pigeon Point, he had spotted the Colombia before the wreck and thought it was the “tender Madrone”–an offical vessel carrying a lighthouse inspector for an impromptu visit. But he soon realized his error as he witnessed the Colombia “lifted by the roll of the sea and dropped again crunching and grinding its nose on the rocks”. It was a painful sight for Capt. Marner who talked like a man witnessing a good friend’s death. By the time Lastreto arrived in Pescadero to wire San Francisco for help, the village was buzzing with excitement. While awaiting reply, he sauntered over to the Swanton House where Sarah Swanton, the inn’s famous hostess, insisted on cooking him breakfast. Emerging from the hotel, Lastreto saw a stagecoach loaded with Pescaderans and city folks, guests at the Swanton House, all headed for the drama at the beach. They welcomed him abord, and when they arrived at the scene of the shipwreck, the fog had finally lifted. The city folk passed the day picking up the limes that swept ashore and later in the afternoon, a trio of tugs arrived to transport the calm passengers to San Francisco. 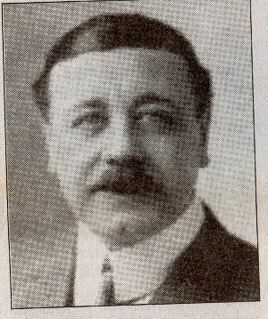 The exact cause of the wreck stirred a contentious debate. “That fog horn must be out of order,” one of the ship’s officers said, referring to the Pigeon Point lighthouse. “My fog horn was blowing twice a minute all night,” dissented old Capt. Marner. 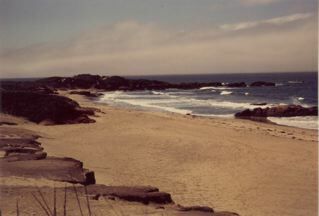 Captain Clark said he confused the fog signal at New Year’s Island (Ano Nuevo) with that of Pigeon Point. The two signals stood not far apart and Clark maintained that he thought he was two miles offshore and some distance north of the lighthouse that marked the final resting place of his ship. The Pescaderans took full advantage of the wreck as a reat quantity of eastern white lead, the prime element of paint, was recovered from the ocean bed. Shortly it was trading at four cents a pound–and according to legend, every house in Pescadero boasted a fresh coat of white paint. Hundreds of feet of white and gold moulding stripped form the steamer’s staterooms were later fashioned into frames. The salvaged copper wire was used for clotheslines from which hung bolts of satin, blue eans, woolen blankets and quilts. Hat racks, writing desks and other furniture from the Colombia furnished nearby Coastside homes. Kitchen tables were weighted down with granite ware, pots, kettles and tin ware, all from the dead ship. You might want to add this story from the July 19th, 1896 issue of the San Francisco Call to your Colombia shipwreck info collection. I’ve got a few others I’ll send along about the scavenging, sightseeing boat excursions, etc. I’m glad the name Colombia Cove didn’t stick. Enjoy. John. faithful “donkey” runs until the tide falls. a season defies the waves. hoisted aboard the awaiting schooners. Bam Rudell will understand the situation. shattered bottom and have disappeared. memento of Colombia Cove’s last victim. contents on the bluff the day before. in to a rock, all the more pitiable. tions when I felt the reef? ground to fragments with my ship. THE SAN FRANCISCO CALL, SUNDAY, JULY 19, 1896.
know how it takes me,” he continued. ing is quickly brought to an end. her became attached to her. if the proper appliances were at hand. By the time the new steamship Colombia (sailing from Central America to San Francisco) neared Pigeon Point lighthouse, south of Pescadero, the fog was thick–so soupy that it was hard to tell whether it was dawn or dusk. A foghorn moaned regularly and thinking he knew the route well, the coffee importer Carlos B. Lastreto warne Capt. Clark, the steamer’s captain, that they were fast approaching Pigeon Point–although the fog made it impossible to actually see the lighthouse. Evidently Capt. Clark thought otherwise. He was convinced the foghorn they heard came from another ship–and Clark briskly walked away, terminating their discussion. Still sensing trouble, Lastreto wandered forward where he met an old acquaintance, a Pacific Mail Line representative. The two men did not speak but exchanged troubled glances as the heavy gray mist cut off all view of the sea. When Lastreto heard the repeated distinct sound of the foghorn, this time closer yet, he tensed. The two men turned toward each other, once again without exchanging a word, then walked to opposite sides of the deck expecting the worst. As the horn blew louder still, grim visions filled Lastreto’s mind. Perhaps seeking safety from what was to come, he headed back to his cabin. Simultaneously, Capt. Clark realized that the Colombia was indeed in trouble–and that she was heading straight into the breakers. “Reverse engines,” shouted the captain. When Lastreto opened the door of his first-class cabin, there was a terrific lurch and the sound of metal grinding on rock as he was flung against the doorjamb. It was 8 a.m. on July 14, 1896 when the Colombia’s bow creaked to its final resting place on the rocky bottom–300 yards from the beach. The Colombia had become wedged between teh rocky claws of a reef half a mile from the Pigeon Point lighthouse. From the beach, the steamers appeared to be lying at anchor but upon closer inspection, a serrated tear had ripped across the bow–and seawater flooded through the open gash and into the forward compartment. An avalanche of small limes tumbled out of barrels and floated toward shore. Photo: courtesy San Mateo County History Museum. Please visit the new galleries at the museum located in the historic Redwood City Courthouse. 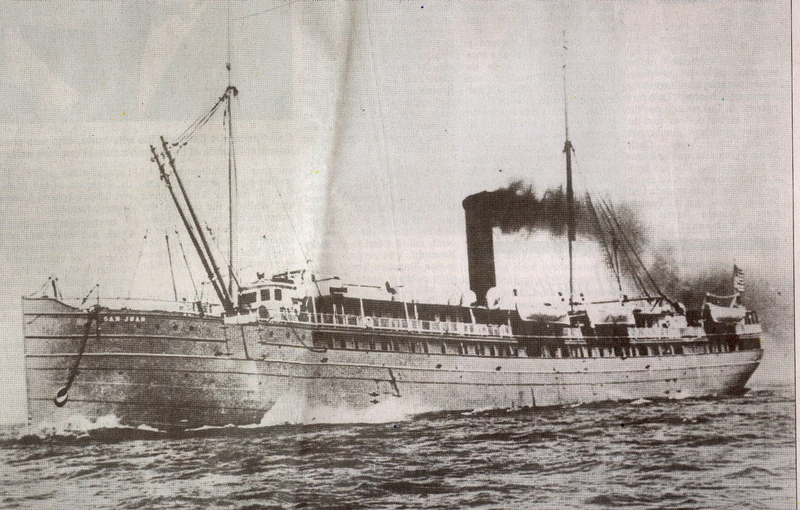 Coffee importer Carlos B. Lastreto frequently commuted aboard Pacific Mail steamers between Central America and San Francisco, all safe, smooth passages. But in the summer of 1896 that changed as the voyage on the new steamer Colombia turned into an odyssey for the future Atherton resident. Even before Lastreto arrived at the dock in Guatemala to board the Colombia, the prominent 29-year-old San Francisco businessman experienced a dose of bad luck. The evening prior to the voyage his wharfside hotel burst into flames. His clothing, documents and cash burned in the conflagration and spectators suppressed their smiles as the young American fled in his pajamas. Fortunately, Lastreto had checked a small trunk with the steamship company. Neatly packed in the suitcase were a pair of shiny dancing pumps and a dress suit. During the early part of the sea adventure that awaited him, this formal outfit was all he had to wear, drawing gentle jibes from his fellow passengers and the Colombia’s friendly crew. Lastreto was becoming accustomed to sidelong glances. From the beginning the weather inhibited the Colombia’s maiden voyage as the journey was immersed in a thick blanket of fog from Cape St. Lucas, at the southern tip of Baja California, until the voyage’s unexpected conclusion. The water and sky seamlessly blended into a wall and vision was limited to 100 yards as the Colombia inched up the California coast to San Francisco, its scheduled destination. By the time the Colombia neared Pigeon Point lighthouse, south of Pescadero, it was almost 8 a.m. but without a clock it was hard to tell the precise time of day. Photo taken in the 1970s. As night fell, the crew believed they were 40 miles offshore–but soon discovered they were in the midst of crashing breakers. The “Coya” rammed a reef, rolled over and sank instantly. Twenty-six of the passengers, including the crew, drowned. Two men and a boy managed to survive by clinging to a rock, then swam ashore for help. Two years later in November, 1868, a combination of a steel gray sky, gusty, unpredictable winds and heavy seas blinded the ship “Hellespont” as she struggled up the coast carrying one thousand tons of coal. Captain Soule, a native of Brooklyn, New York, mistakenly believed he was 20 miles off the coast when the “Hellespont” was engulfed by the breakers and crashed into the black reefs. As the breakers swung the “Hellespont” around wildly, the ship split in half–and the main deck was carried out to sea. Captain Soule and seven of his men perished. The rest of the crew reached help at the Portuguese whaling station at Pigeon Point. 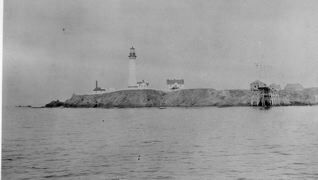 The tragic loss of lives aboard the three vessels contributed to a popular, local movement seeking construction of a lighthouse at Pigeon Point, a project completed in 1872. In the summer of 2001 something white in the sand caught the eye of a hiker as he walked among the wind-eroded dunes near Point Ano Nuevo. There was something about it that made him start digging. He quickly uncovered a shocking discovery that made him think violence had happened here: Murder. For there, only inches beneath the sand in front of him, he later told the San Mateo County Sheriff’s Department, there was a skull. Actually, the sheriff’s investigation would find there were many skulls there and many leg and arm and back and rib bones. Dozens of them. Enough to fill a cemetery. And indeed, that’s what the hiker had found, a cemetery lost for decades among the shifting sand dunes. 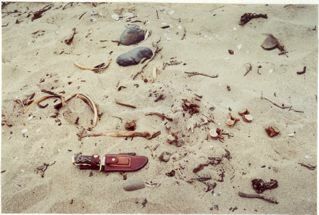 While wrong about this being a murder scene, the hiker was right in surmising that these unfortunates had died violently and the clue was in the roaring of the surf that pounded the nearby beaches. The sound of the surf is probably the last thing these poor souls heard and is precisely why most of them died. These dead people had once strode the decks of sailing ships such as the “Sir John Franklin”, the “Coya” and the “Hellespont”. All perished in the 1860s when their ships, blinded by the heavy fog, struck reefs between Pigeon Point and Ano Nuevo and sunk wuth heavy losses of life. The dead were buried side-by-side in a dunes area originally fenced off and marked with headstones. The remains of ship’s officials were generally not found at these sites as relatives often claimed them for burial in family plots. Overtime the strong winds disturbed the sand dune environment, exposing the cemetery site. the shipwreck victims had been buried in redwood coffins–but even this superior wood could not withstand the effect of the sometimes brutal weather and the coffins are now the consistency of wet cardboard. When I last worked on this story, park rangers were working to stabilize this historical shipwreck gravesite so not to disturb the human remains. A pedestrian boardwalk was to be built with interpretive signs enabling the visitor to learn about the cemetery (and at the same time they will be advised of the laws against disturbing archaeological remains). Thick fog often hugs the rugged coastline near Point Ano Nuevo–but since 1872 the lighthouse at Pigeon Point has warned ships away from the nasty reefs that had once doomed many a vessel. Before the lighthouse existed, many ships perished in the fog along that perilous coast, including the sailing vessels “Sir John Franklin”, “Coya” and “Hellespont”. Without the warning beacon of a lighthouse, all three captains believed they were far enough out at sea, safely away from the spectacularly beautiful but dangerously deceptive coastline. Carrying a cargo of pianos, dry goods and liquor bound for San Francisco in the winter of 1865, the Sir John Franklin lost her bearings in a dense fog and mopuntainous sea. The weather cleared–but it was too late to save the “Sir John Franklin”. Caught by the fast moving breakers, the vessel screeched loudly as she slammed into the open fist of the reefs. Upon discovering a gaping hole in the vessel’s hull, all aboard abandoned ship. The captain, first mate and eleven crew members struggled against the powerful surf but all met a watery death. 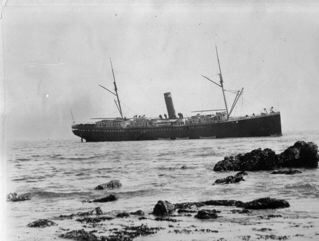 A few posts back I wrote a three-part story about the shipwreck of the San Juan near Pigeon Point in the summer of 1929. Some 72 people died when the San Juan, a vessel that commuted between San Francisco and L.A., was struck by an oil tanker. It was a horrible tragedy taking the life of Mountain View resident, Emma Granstedt, a wife and mother. Her husband, Theodore, survived but perhaps in a much grimmer way (if that’s possible) than what I found during my research . Annette’s version has the ring of truth. Could this be movie material?